Will you believe it? 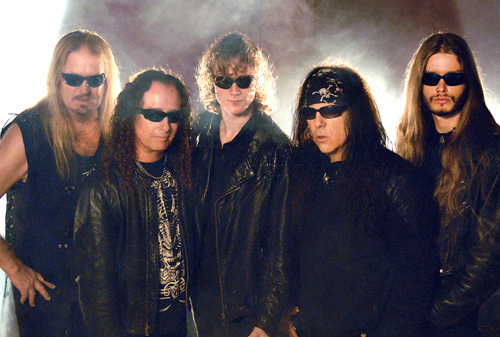 Thirty-six years ago guitarist Geoff Thorpe formed Bay Area metal band Vicious Rumors. That's a long time to be forging American power metal. Perhaps what's even more amazing is the simple fact that, in those many years, Vicious Rumors has been recording albums and touring on a consistent basis. That's moxy and persistence. They return with their twelfth studio album, Concussion Protocol, still with German metal label SPV/Steamhammer, and also with new vocalist Nick Holleman on his first VR recording. Suffice to say, the title for this album tells the tale. 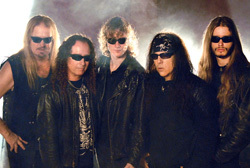 Vicious Rumors never does anything half-assed when it comes to their American power metal. Their sound is hard and heavy, brisk and bracing, and generally, well, relentless. All this revolves around a twin guitar barrage of riffage and screaming solos which, in turn, are stoked and powered along by an aggressive thundering rhythm section. If that's no enough, Holleman also has an assertive and raw voice to match the metal intensity. Intensity. Yeah. It's concussive metal, something like blunt force trauma to the head from The Walking Dead's Neegan and his barbed wire baseball bat. With this album, I'm wondering if Thorpe and Vicious Rumors aren't simply trying to pander to the modern metal fan by being increasingly harsh. (It's just a thinking out loud query.) But is there any respite amidst the crush of riffage and speed? Not really. Maybe with Take It Or Leave It, a song which moves with a rock groove and the melody rises a bit higher. Or perhaps the closest thing to an anthem, Circle Of Secrets, which is dialed back, maybe to seven or eight on the amp knobs, in the first half, only rise in heaviness and power to finish. All in all, Concussion Protocol is simply Vicious Rumors doing what they do best: aggressive American power thrash metal. 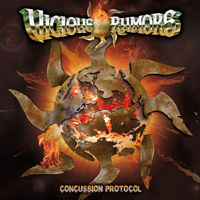 Concussion Protocol is simply Vicious Rumors doing what they do best: aggressive American power thrash metal. Nuff said.